This was a 50 day trip with two different safari's and some time on our own in Johannesburg and Pretoria South Africa, a day in Nairobi, Kenya and a day in Amsterdam, Netherlands. 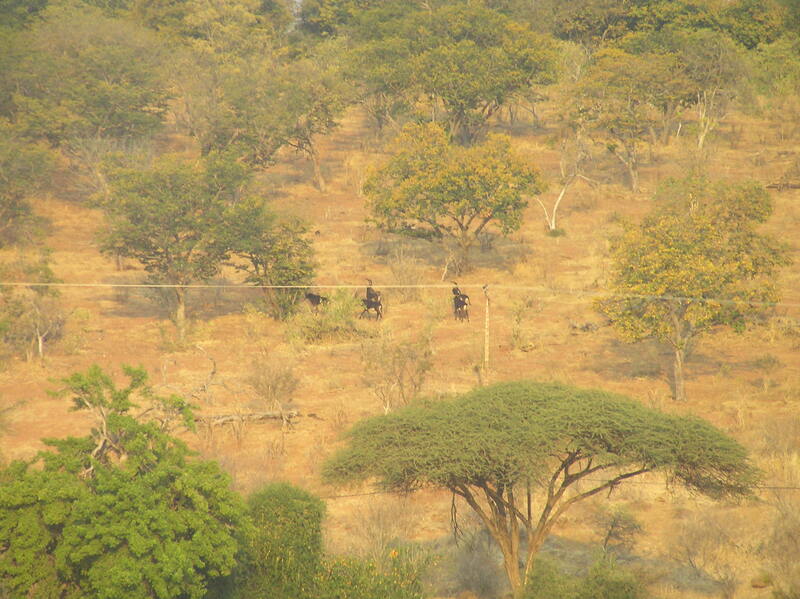 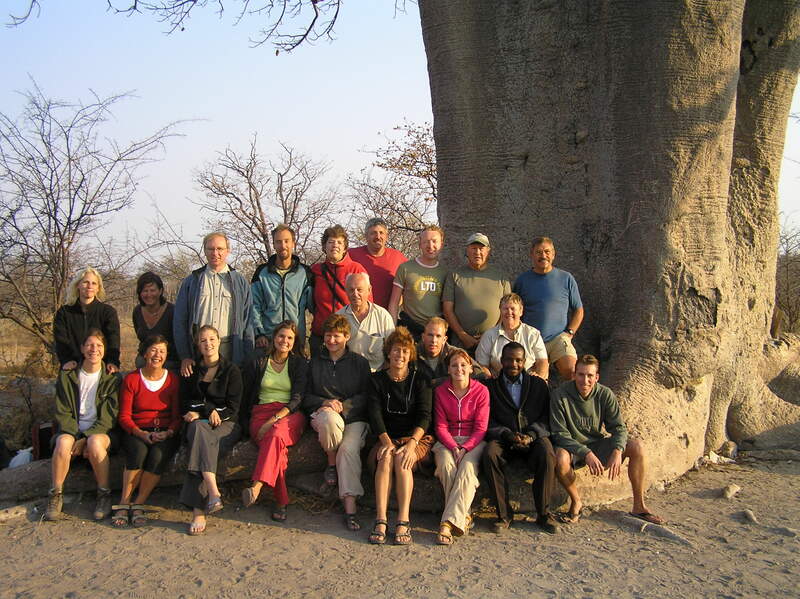 Both safari trips were with people from the Netherlands, we were the only Americans on the trips. 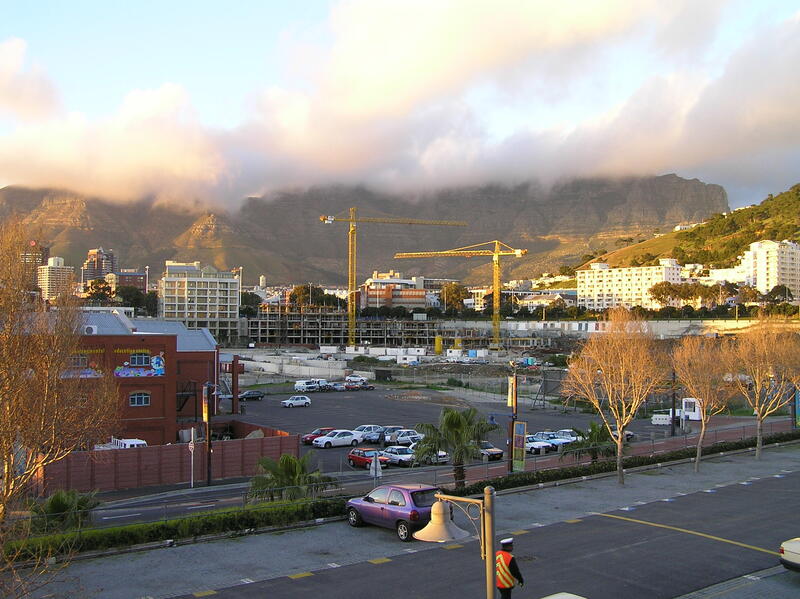 Our first early morning view of Table Mt. 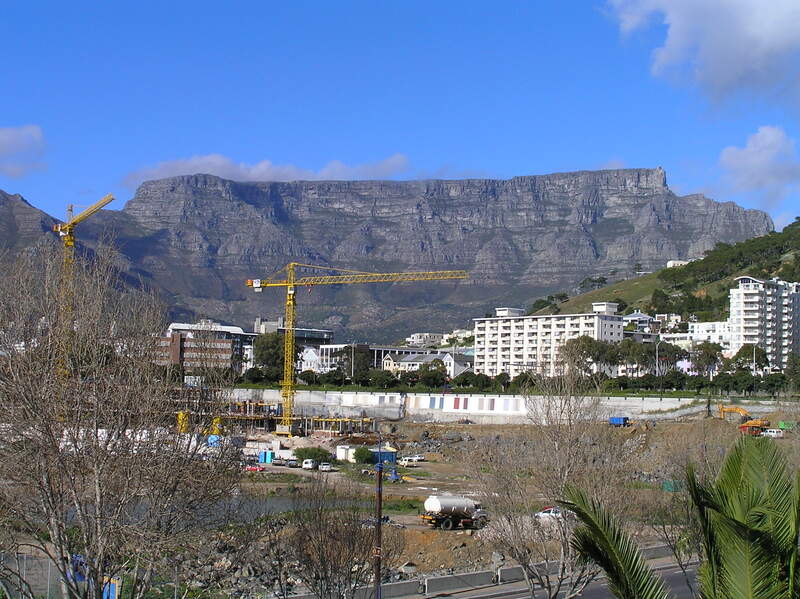 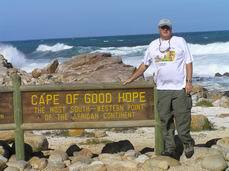 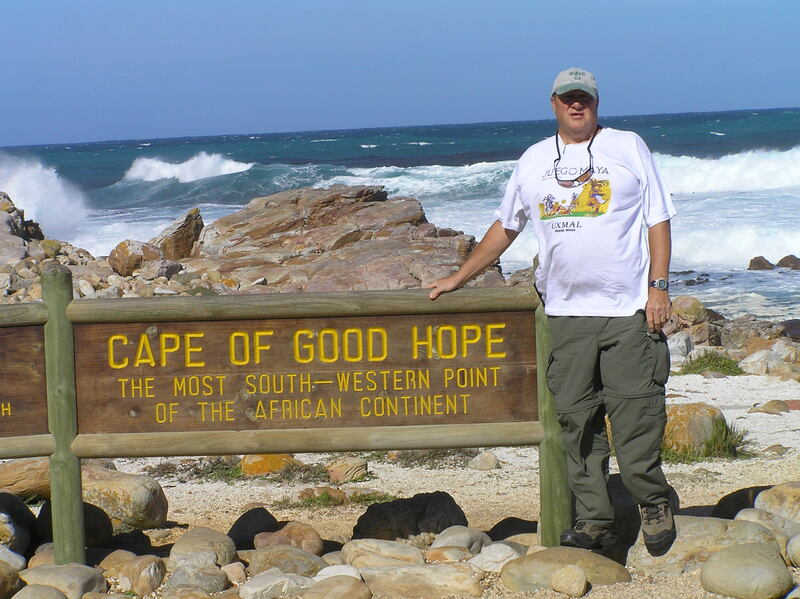 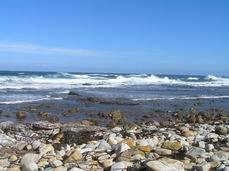 at Capetown, South Africa. 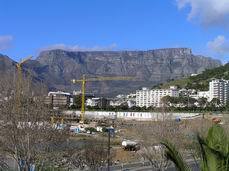 Eventually the clouds lifted and here is a picture of Table Mt. 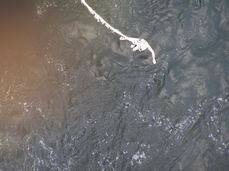 in the clear. 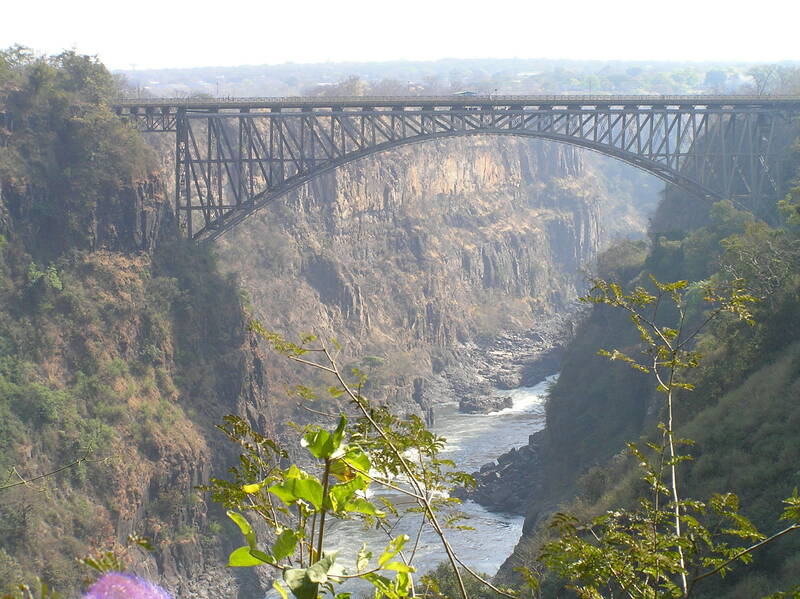 Very scenic but chilly as it was winter and the dry season. 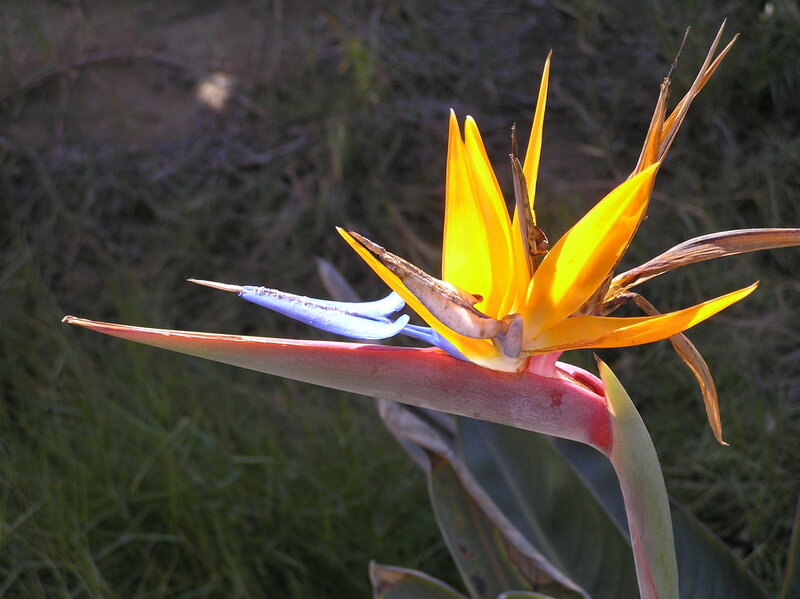 There seasons are opposite of ours. 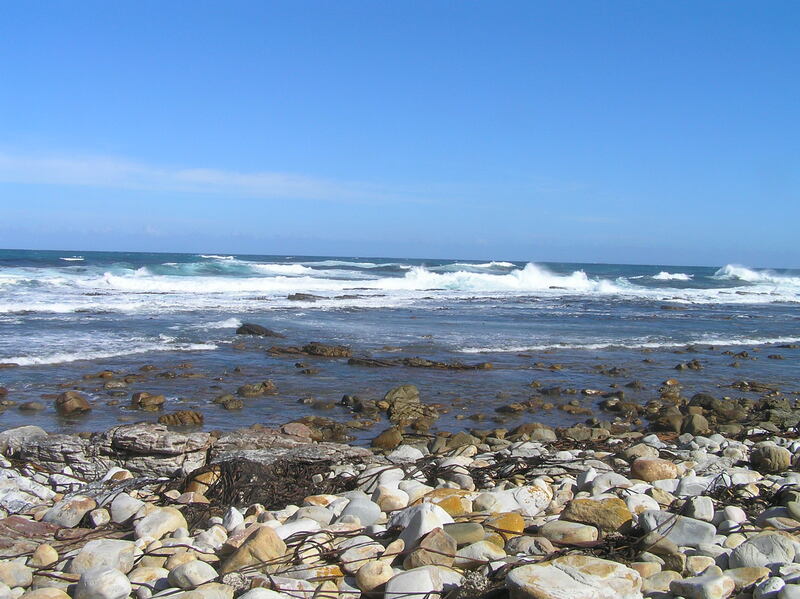 Very nice surf coming in. 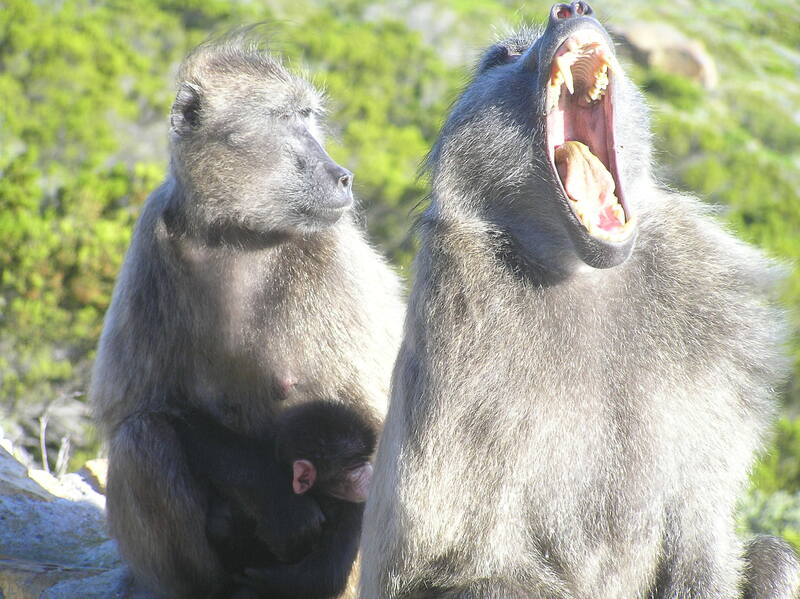 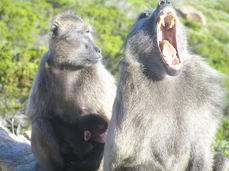 Baboons were to used to people and were a nusiance! 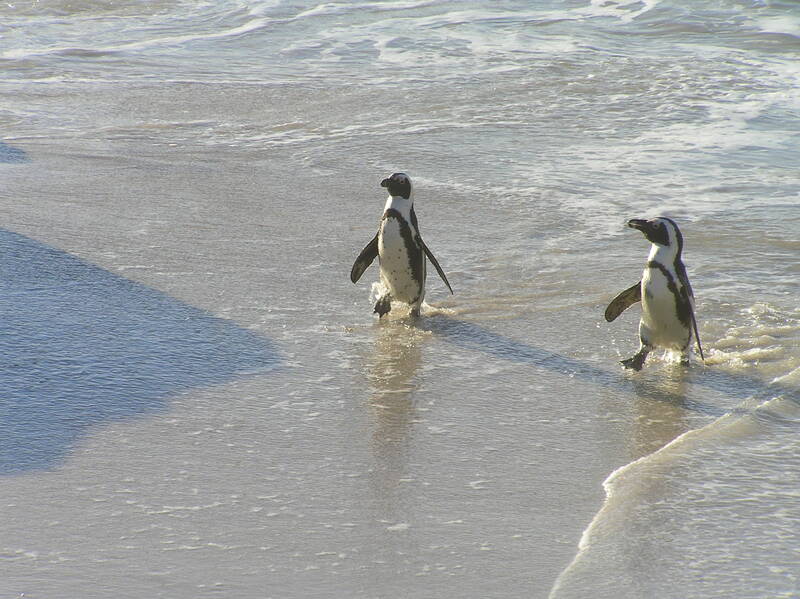 African Penquins (nickname donkey penquins as they sound like a donkey braying) at Boulders near Simon Town South Africa. 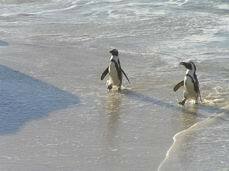 Penquins are only found at the south pole and these are the fartherst north of any. 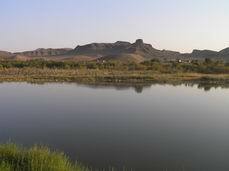 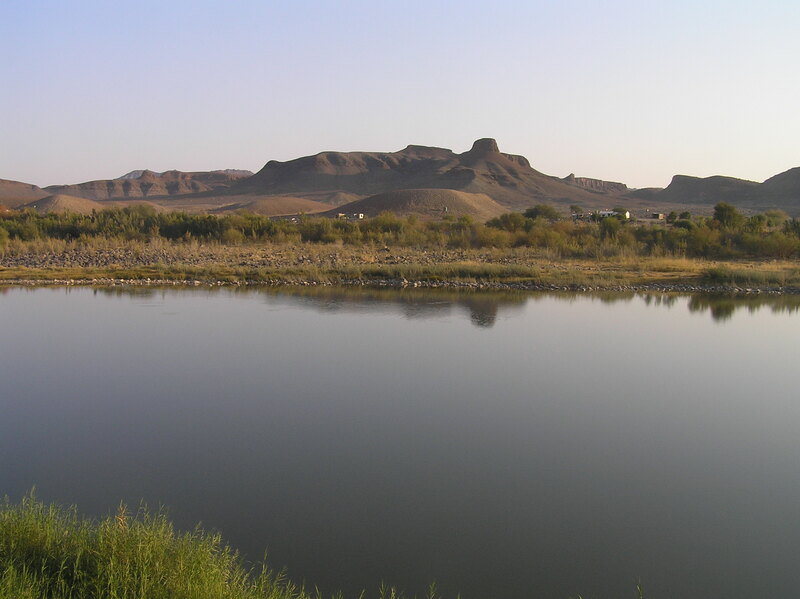 The Orange river looking from Nothern South Africa north into Namibia. 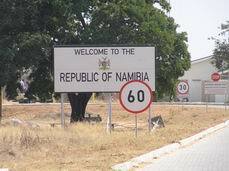 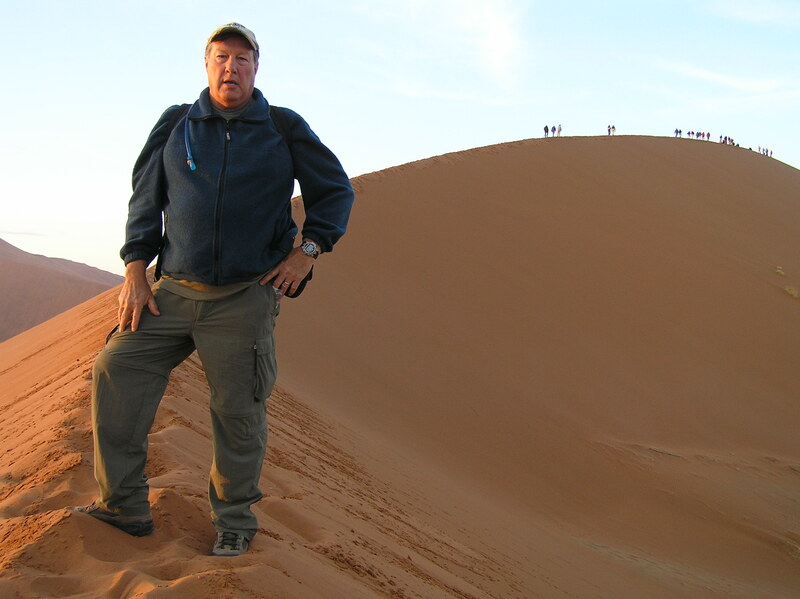 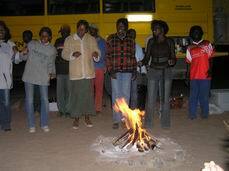 Entering Namibia, very hot here in the summer, definitely a dessert in many areas. 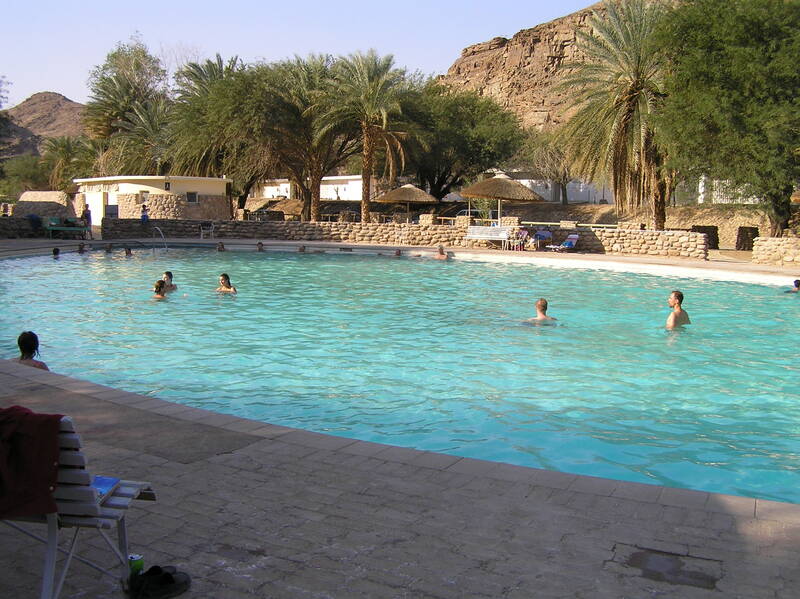 Warm Hot springs in the southern desert of Namibia. 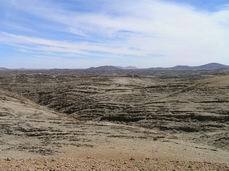 Fish River Canyon the grand canyon of Africa but certainly not like the USA Grand Canyon but very scenic. 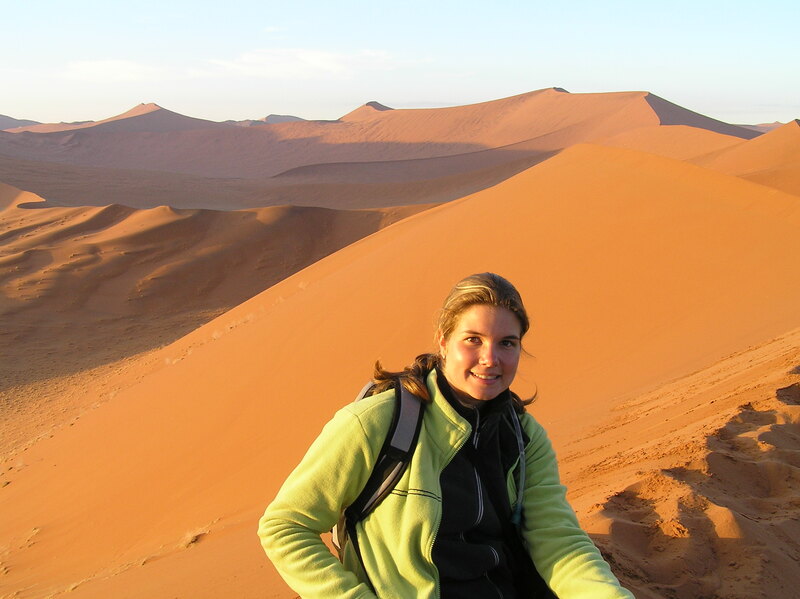 These two are sisters from Holland, on the left is Susan who is an English literature major and she was kind in intrepreting Dutch into English for us and to the left is Wendy. 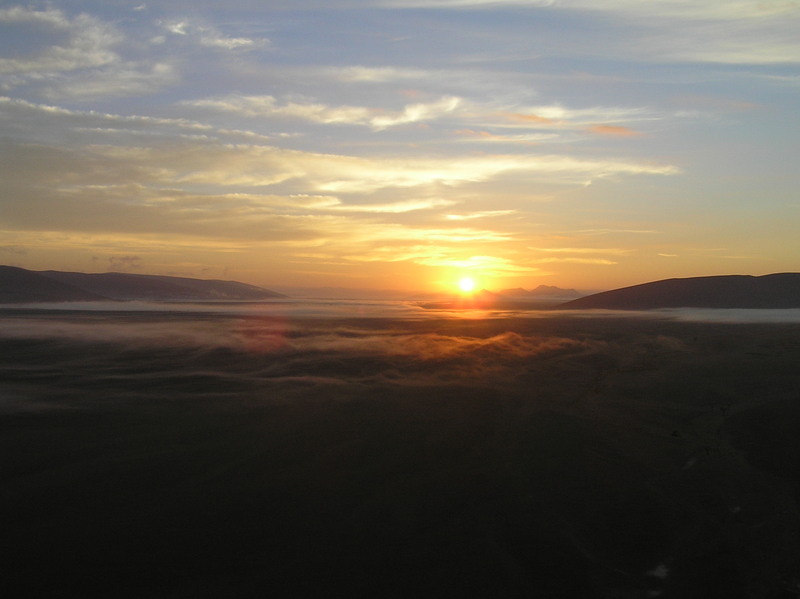 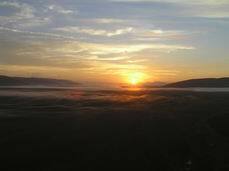 Sunrise from the Red Sand Dunes. Wendy and I were hiking up one after the other so we traded off taking pictures of the dunes. 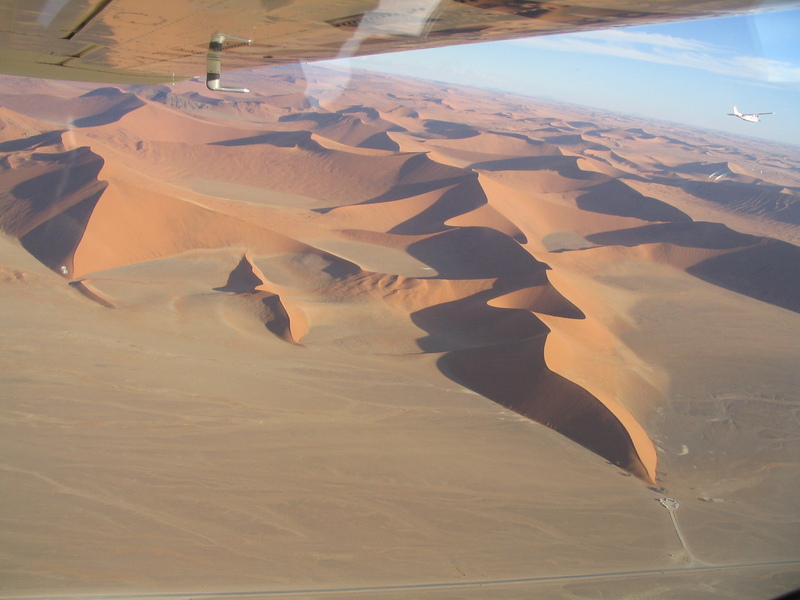 Picture by Wendy Hoogland of our group, Aerial view of the red sand dunes. 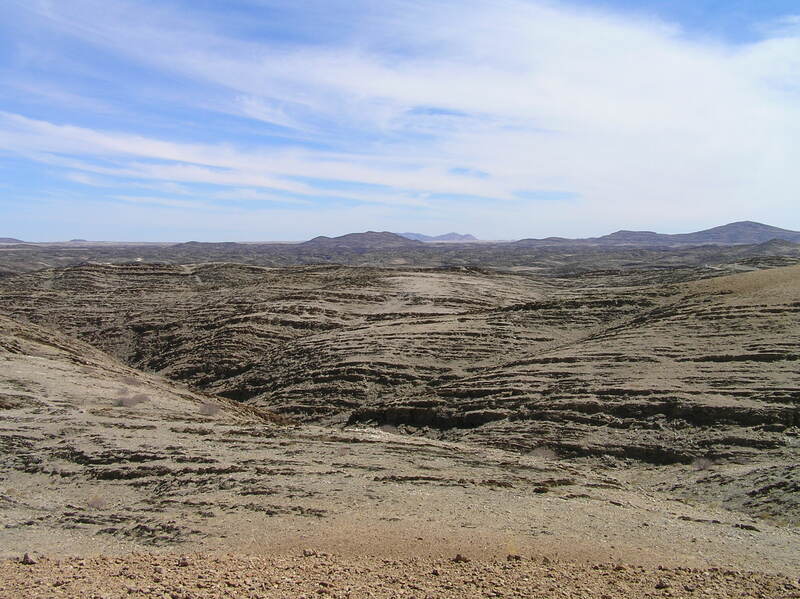 Moon like landscape as we traveled north in Namibia toward Walvis Bay. There were some granite mines north of this area. 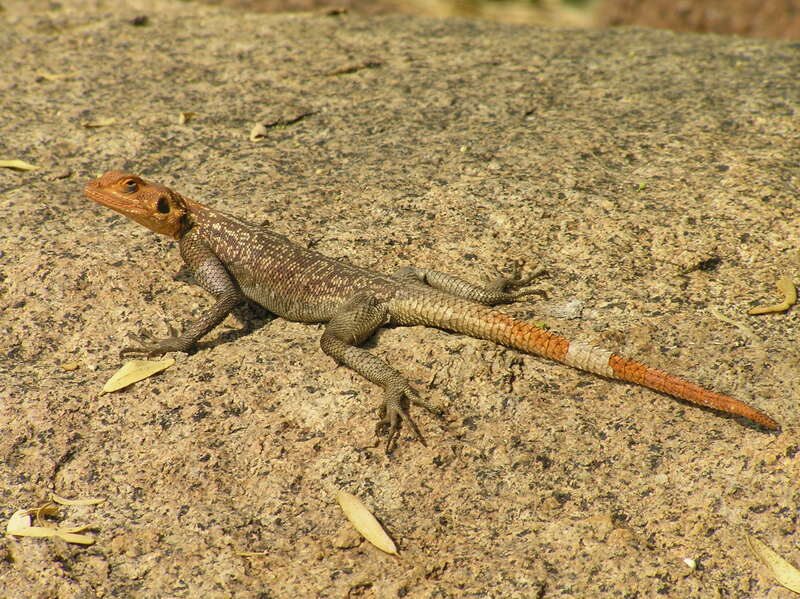 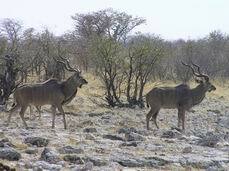 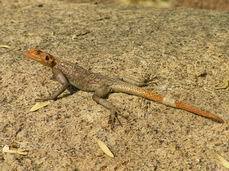 One of the first animals along with Springboks we seen in Namibia. 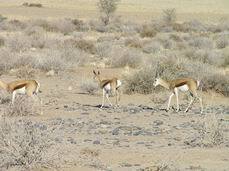 This animal is also called Orynx and is very well adapted to the hot, dry dessert. 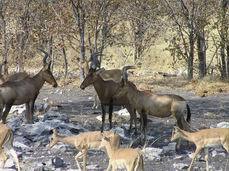 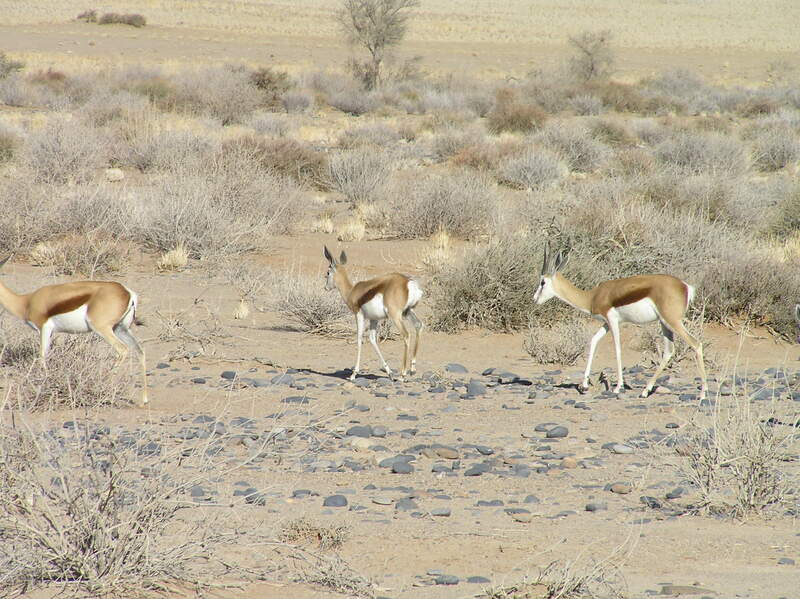 There were Springboks every where it seemed here in the dessert. 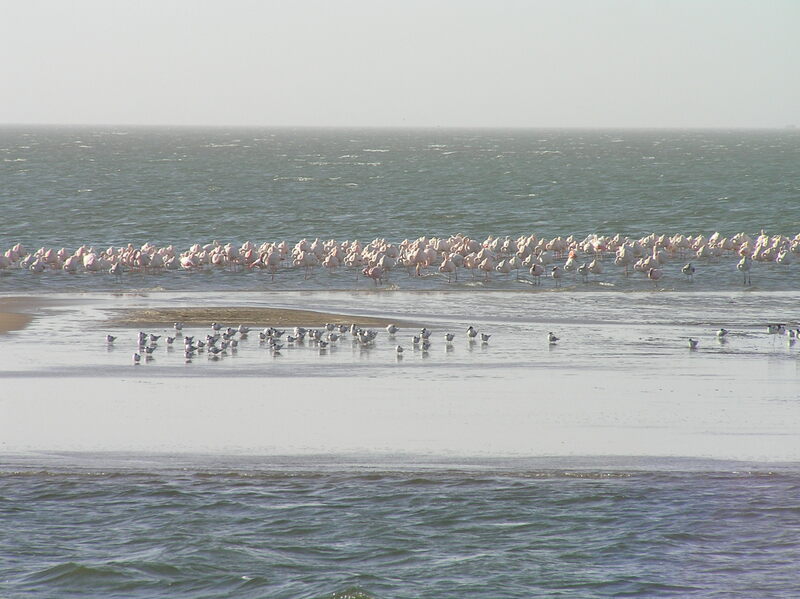 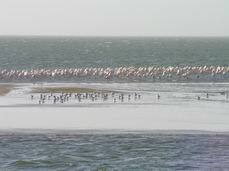 Flamingos at Walvis Bay an oasis in a dessert along the ocean. 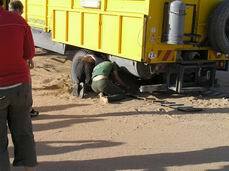 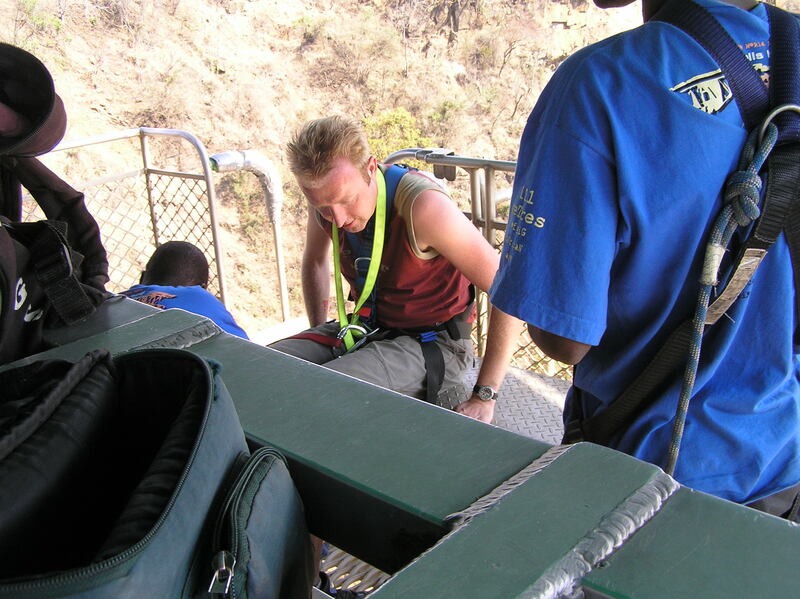 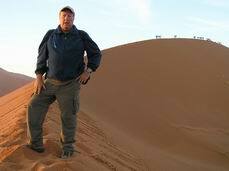 We got stuck in the sand, note the steel tracks we laid down, standard equipment to carry on safari. 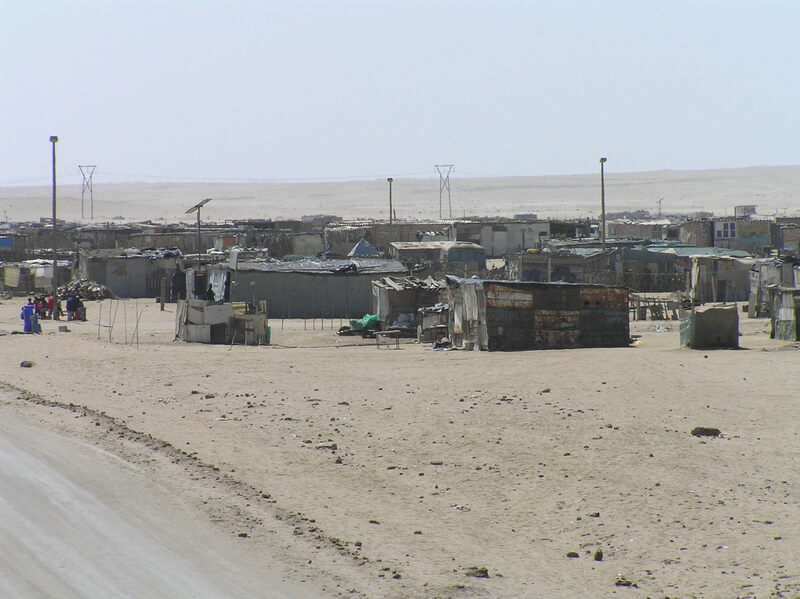 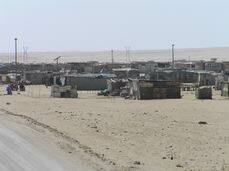 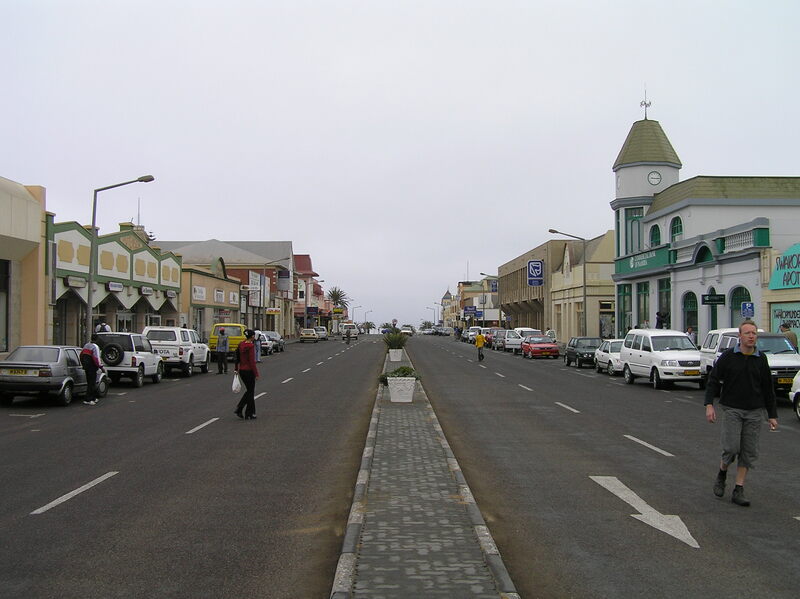 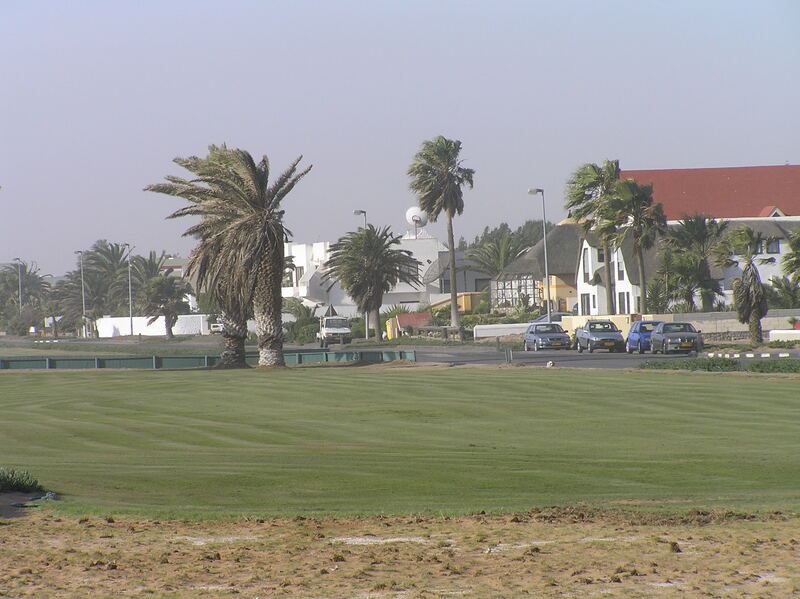 Houses at Walvis Bay, German heritage. 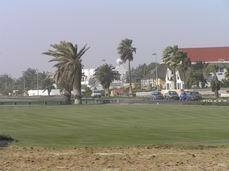 Swakopmund a German town, fun place, good food. 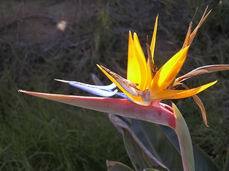 Bird of Paridise flower in Swakomund. 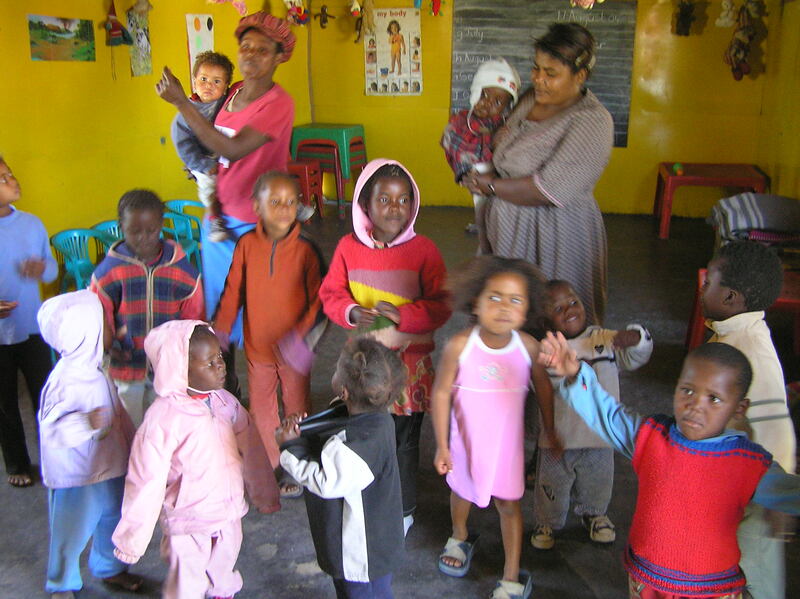 Kids at a pre-school in the township, They wanted to hold your hand, in fact it was a 'fight" as to who got to hold you hand. We found this repeated many, many times where ever we traveled in Africa. As part of our noon meal at the township we had fried grubs. 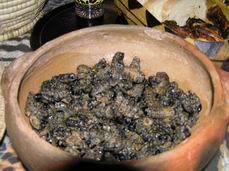 They were not bad, Edith gagged and could not eat them. 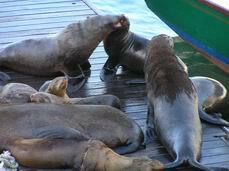 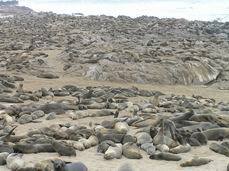 Fur seals at Cape Cross. North of here are the diamond preserves which belong to the government. 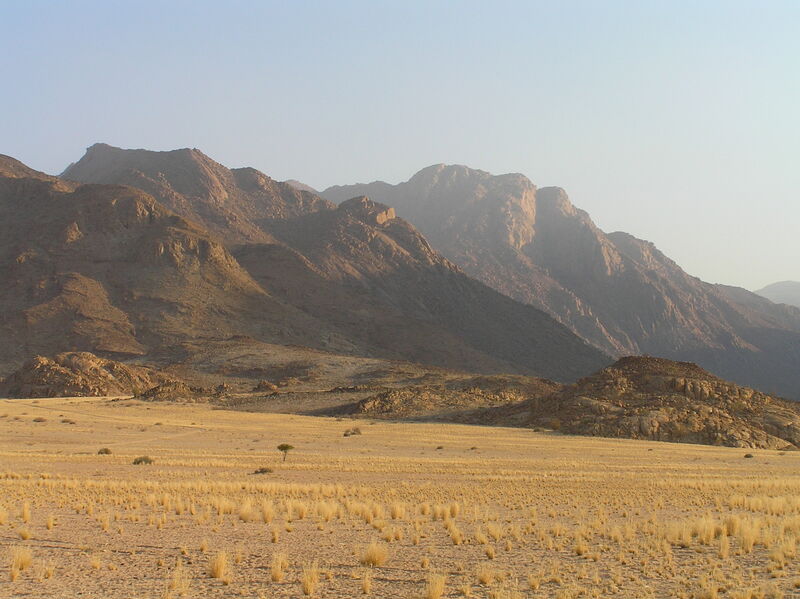 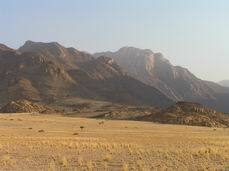 Highest mountain in Namibia in the Brandberg area. 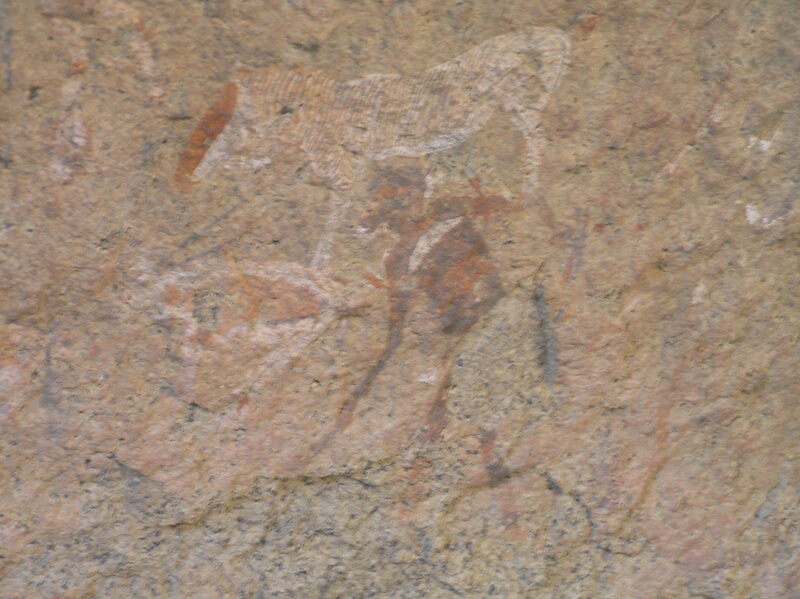 Famous white lady bushman painting in Brandberg Mountains. 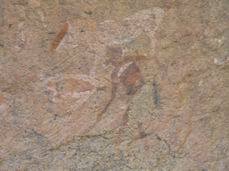 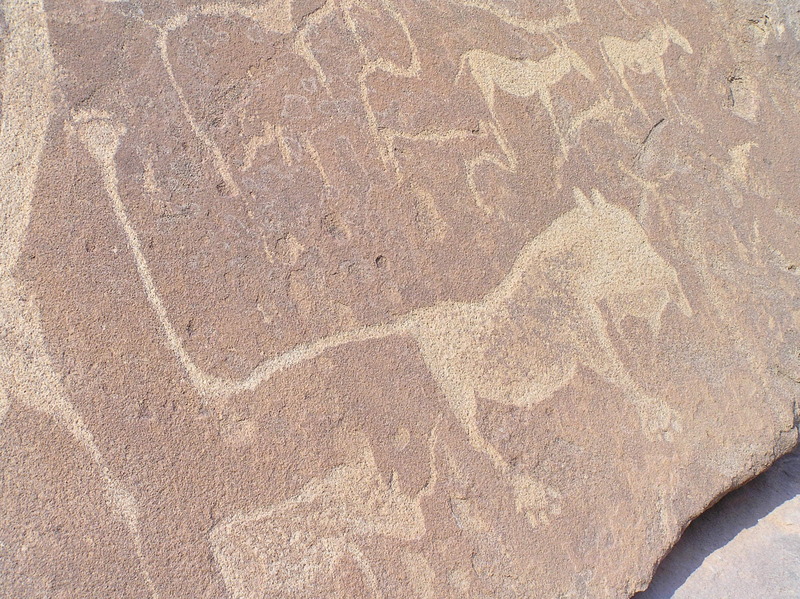 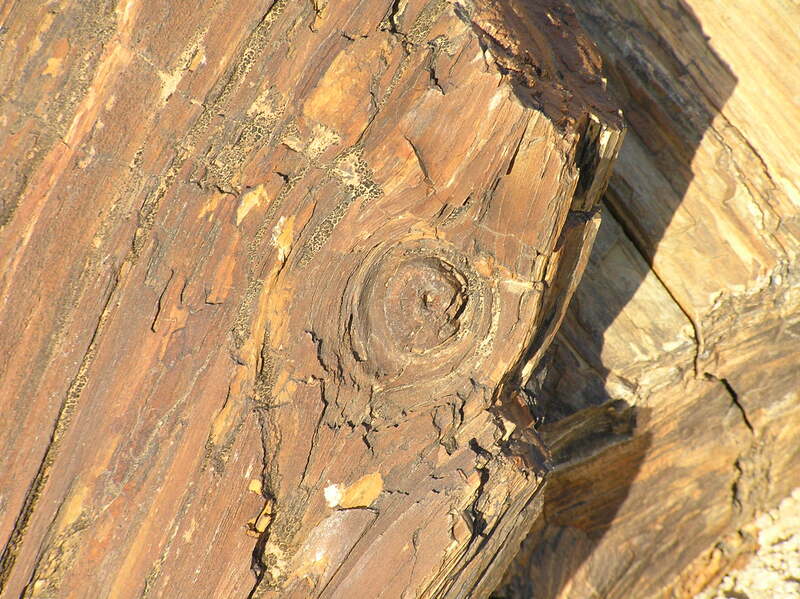 More bushman art, carved rather than painted in Twijfelfontijn area. 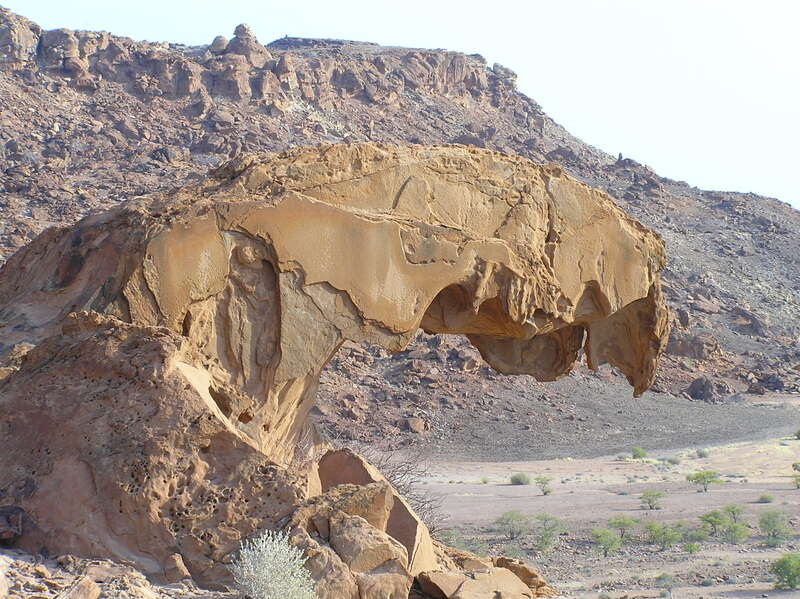 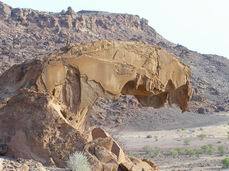 Famous rock formation in Namibia. Native dancers at campsite near Twijfelfontijn, these and other always like to sing the Namibia National Anthem both in English which was the official language and their native language. 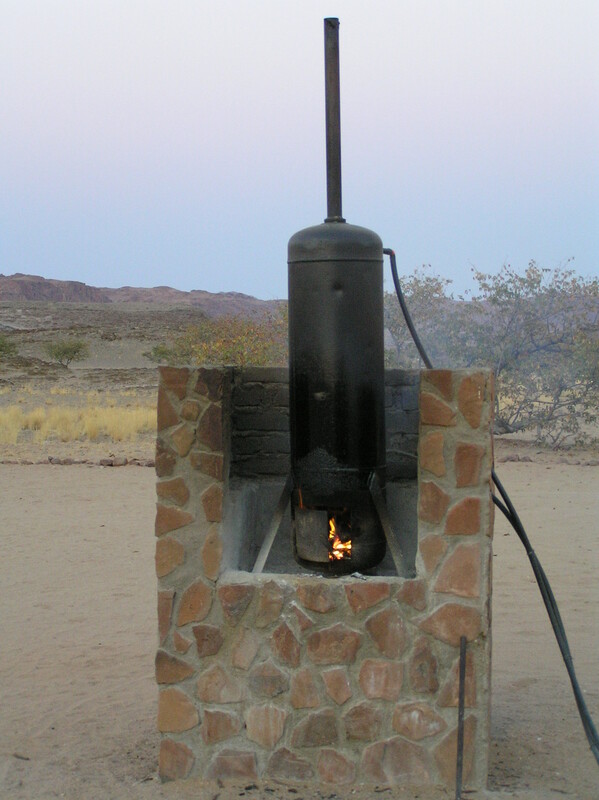 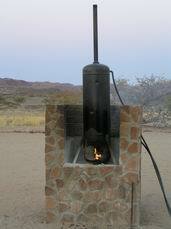 Wood hot water heater, very common in Africa, loss of trees in Africa is a big conservation problem. 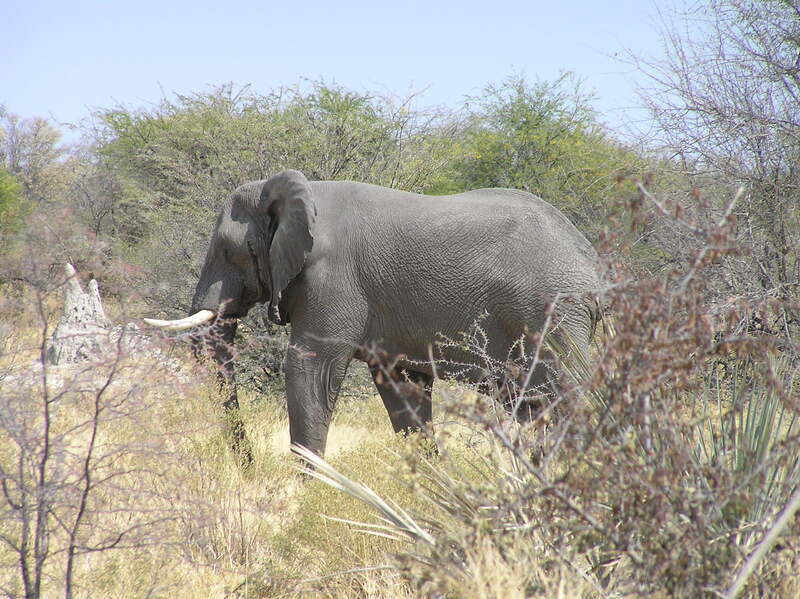 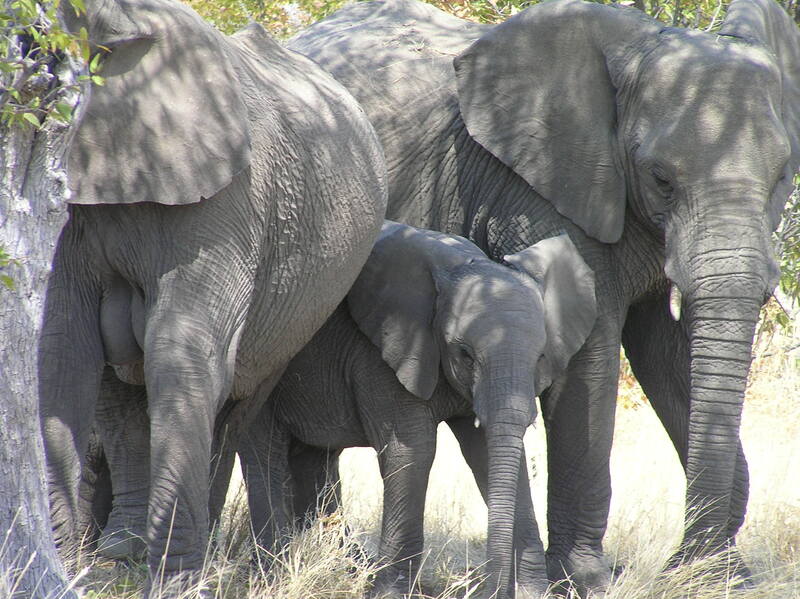 Elephants in Etosha NP in Namibia. 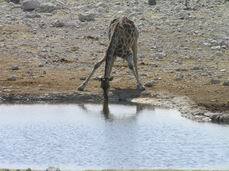 Giraffe drinking at the water hole, a fairly rare picture. 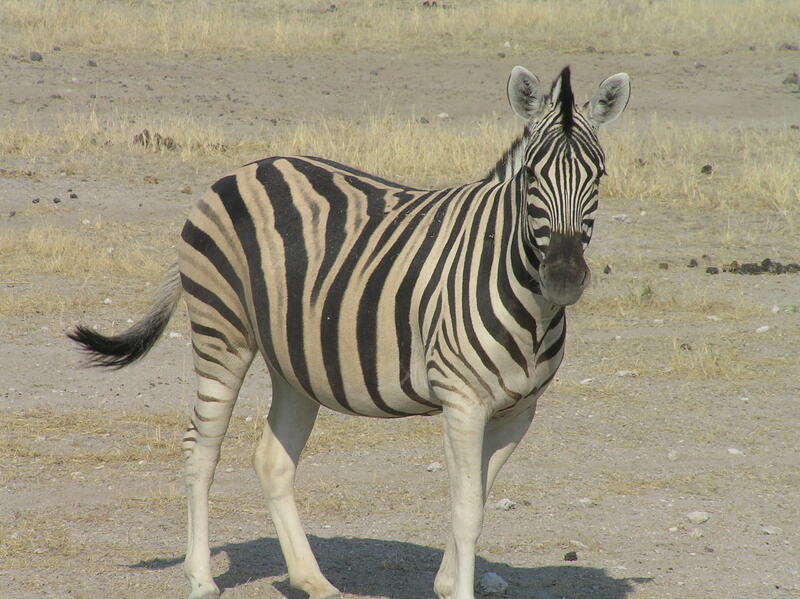 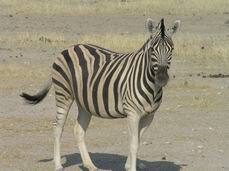 This is the typical Zebra called Burchell's. Entering Botswana. 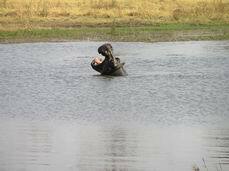 They have a lot of money from diamonds, strick agriculture regulations especially on meat because of hoof and mouth disease. 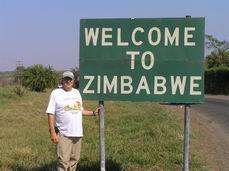 There currency is strong so our money did not go far here so we did not buy much. 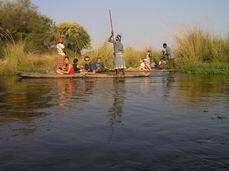 Mokora boats used to bring us out into the delta to camp for three days. 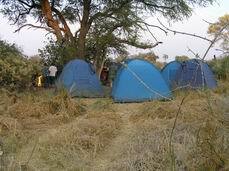 Our primative campsite in the Okavango Delta, no facilites at all for three days. 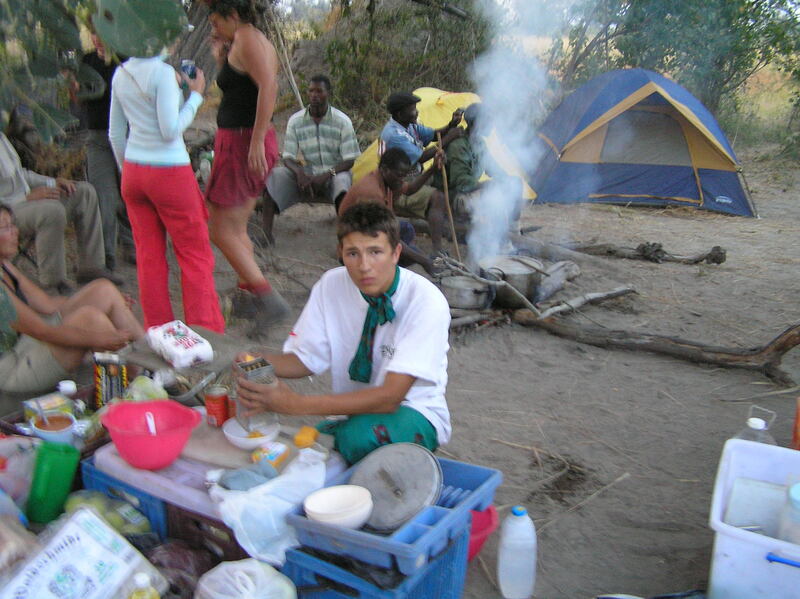 Our cook Char and our campground in the Okavango Delta. 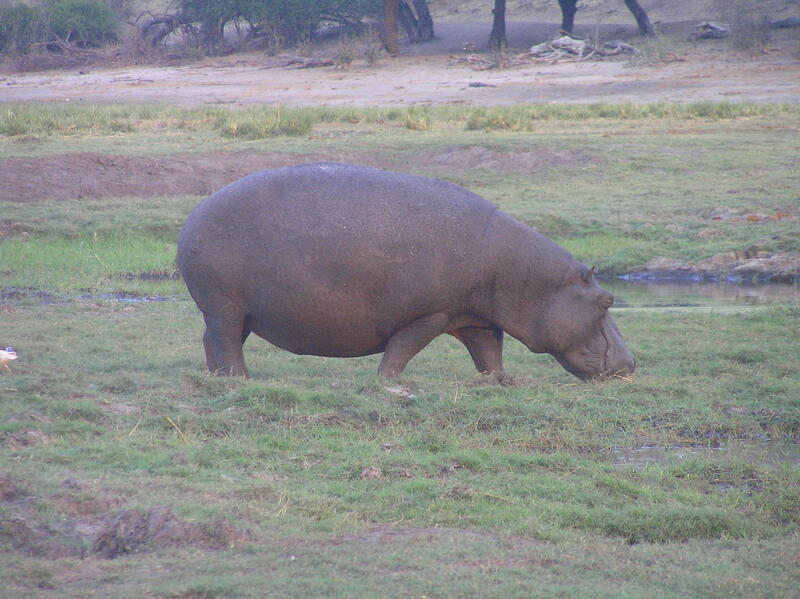 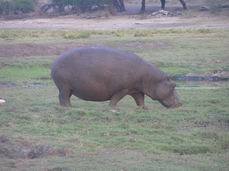 On a hike in the Okavango Delta I see my first Hippo. 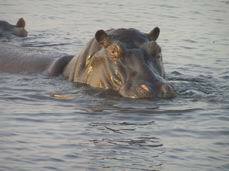 More people are hurt or killed by Hippo's than any animal in Africa. 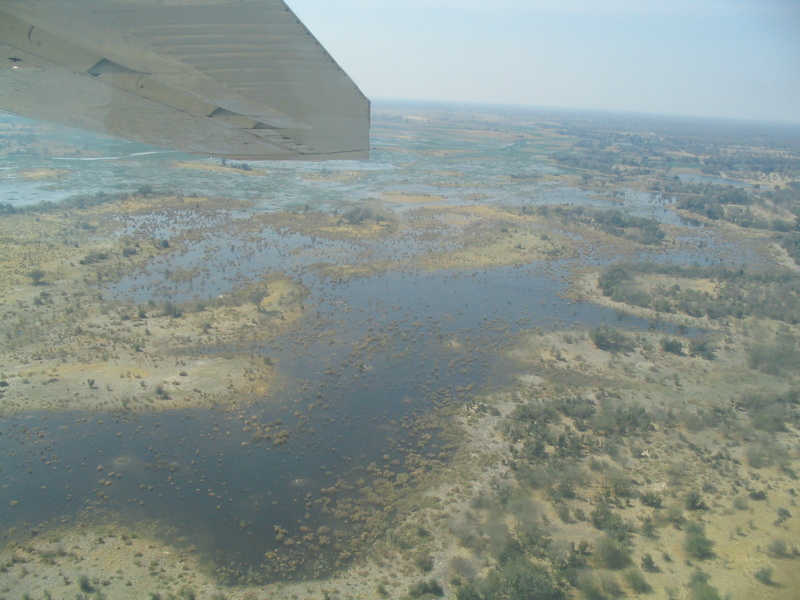 Picture by Wendy Hoogland of our group, Aerial view of the Okavango Delta. 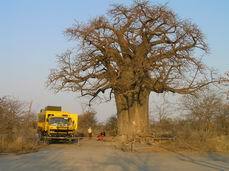 Baobab tree the oldest tree in Africa. 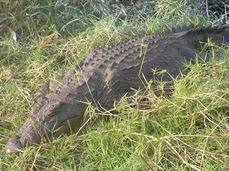 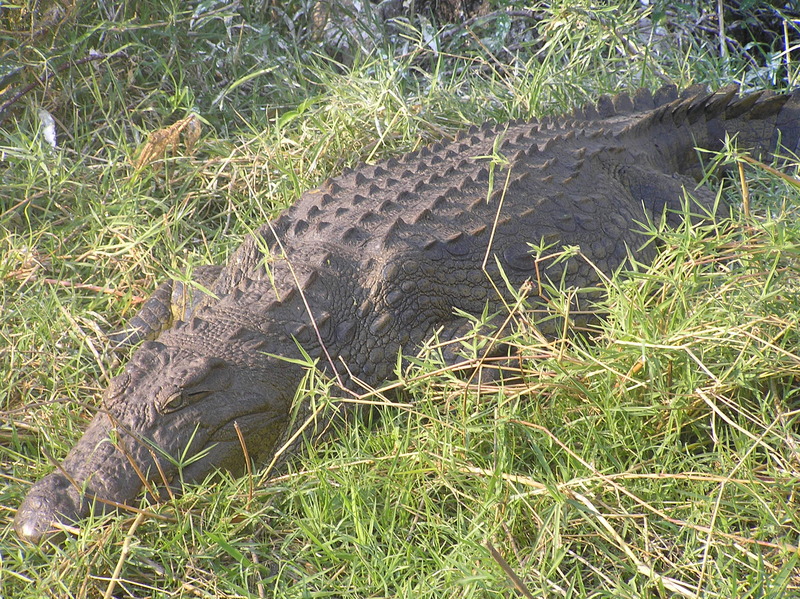 Crocodile in Chobe NP Botswana. 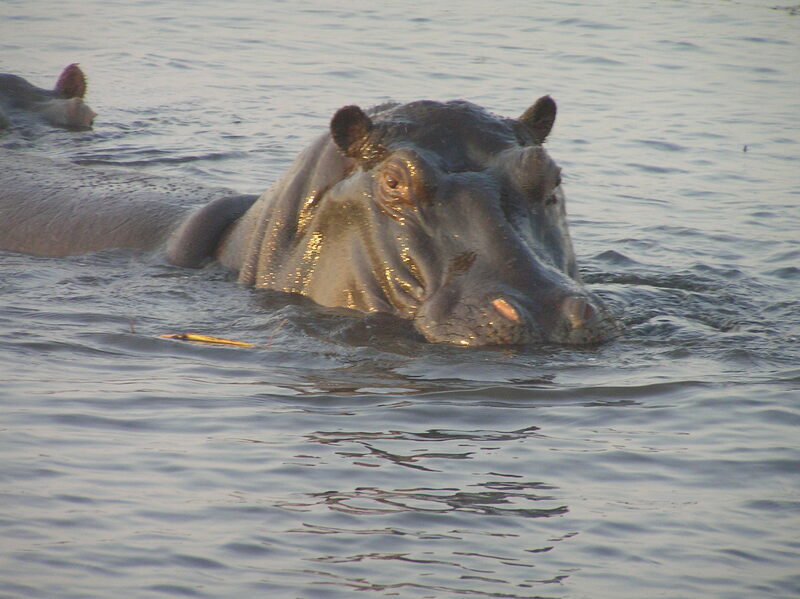 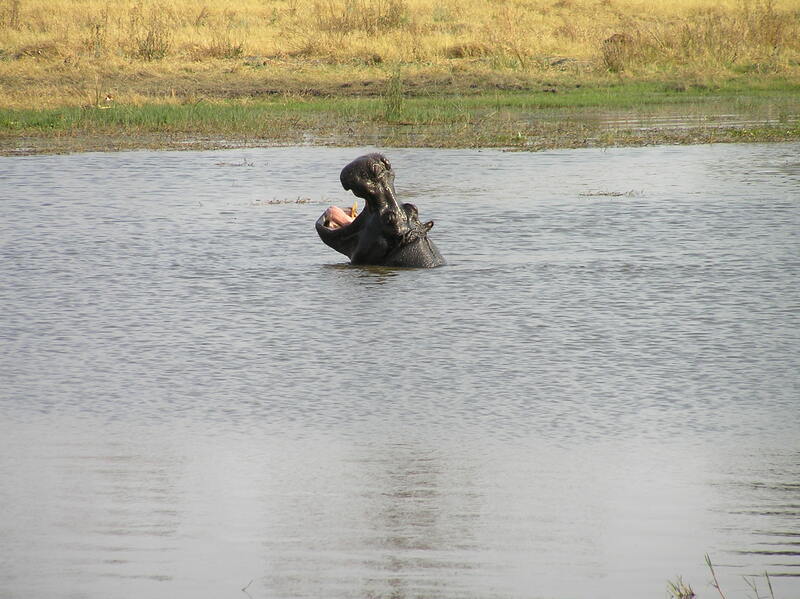 Hippo on land in Chobe NP. 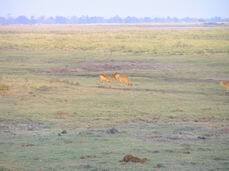 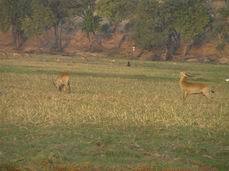 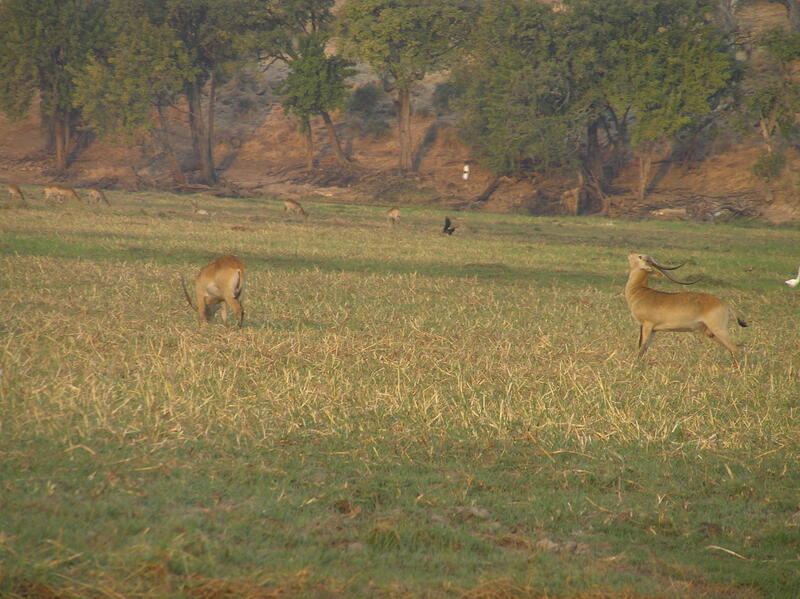 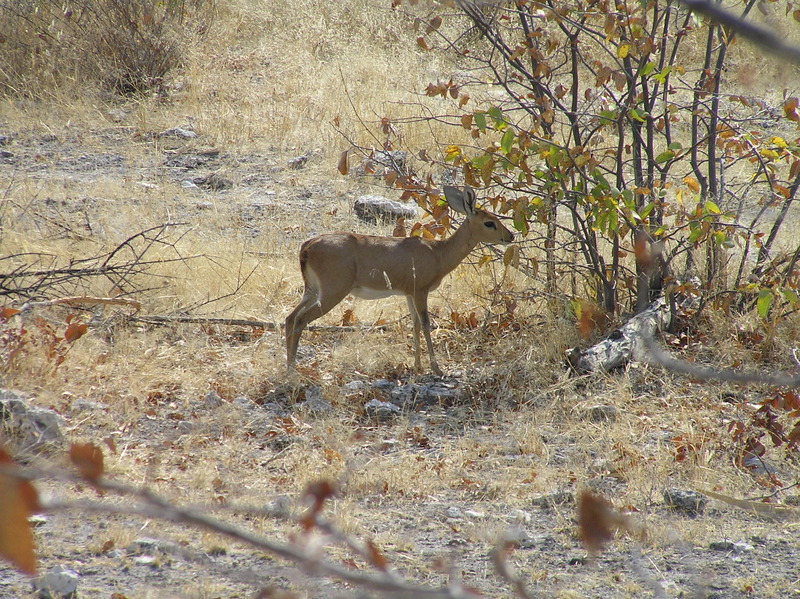 Puku, pretty much only found in Chobe NP. 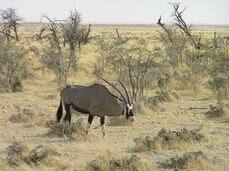 Sable, beautiful black and white animal, the only ones we saw, quite aways away. 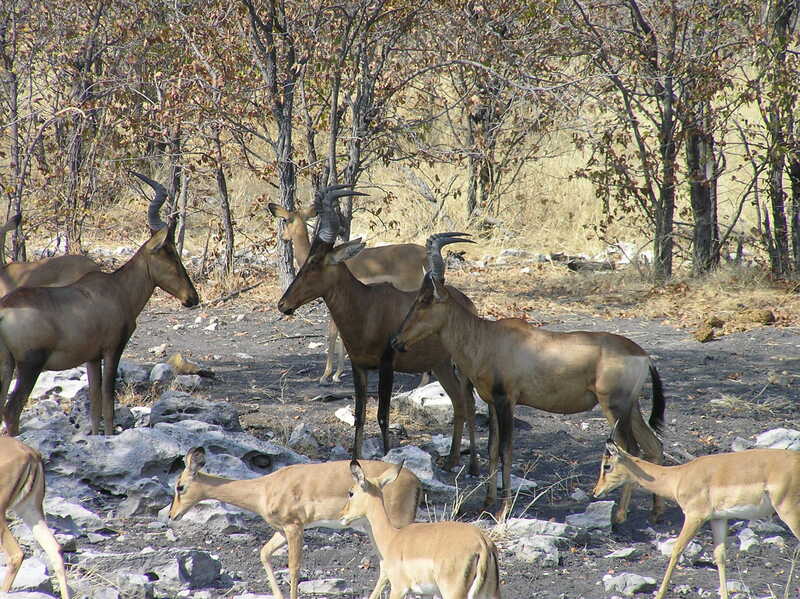 Red Leche in Chobe NP. 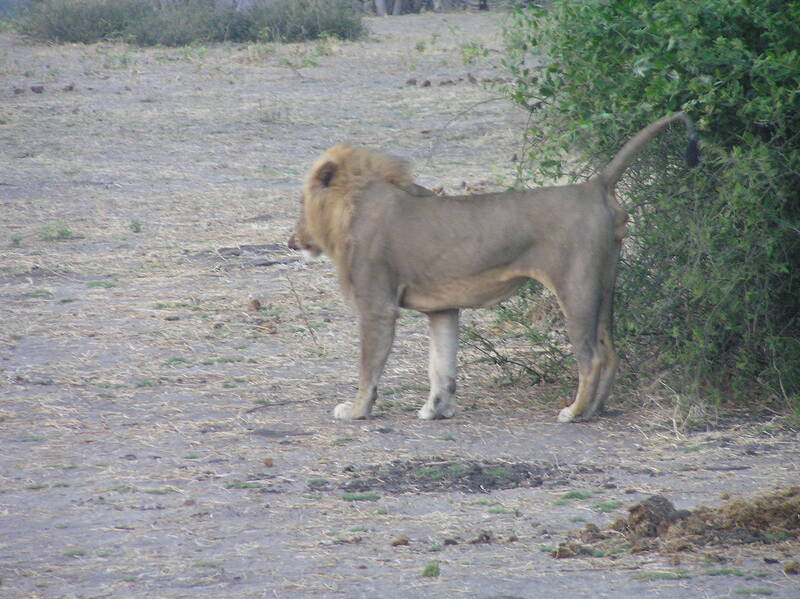 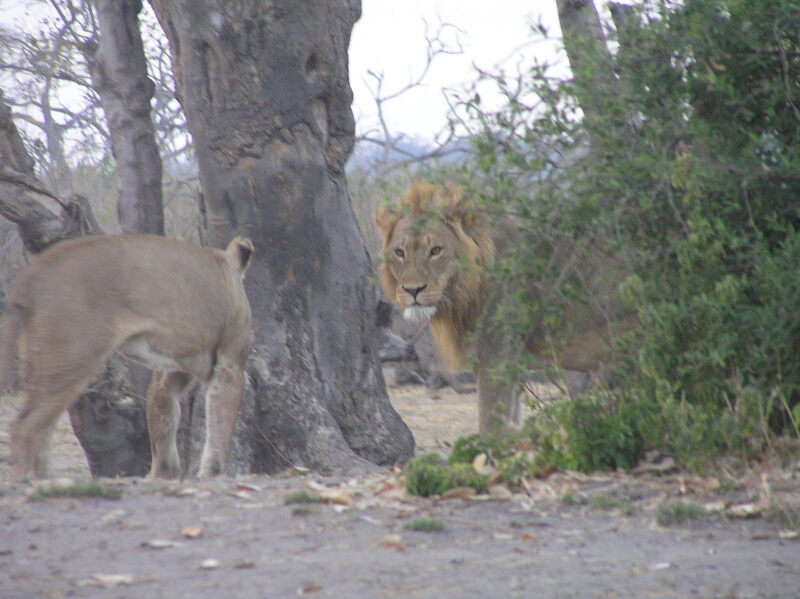 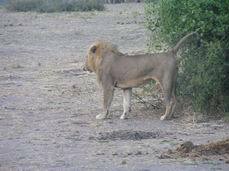 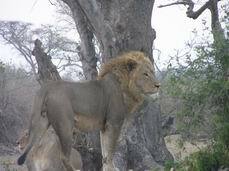 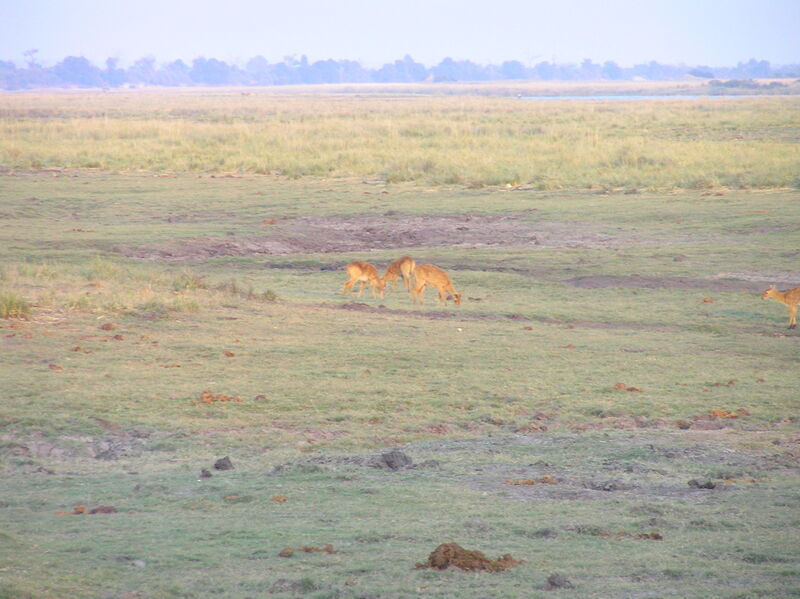 Our first Lion sighting of the trip, very exciting, we were in an open vehicle and we were close. Male now joined by a female lion. 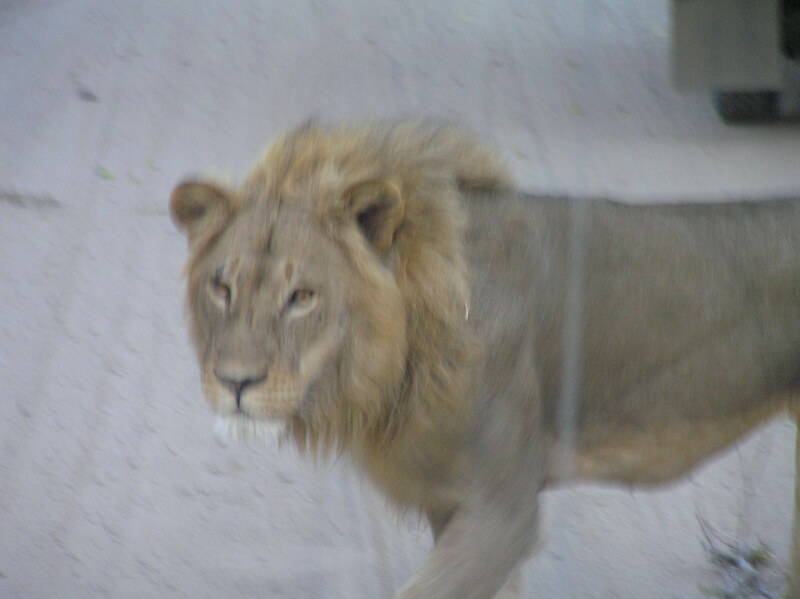 I was so close and he was moving and it was not real light yet I did not wait long enough for my camera to focus. 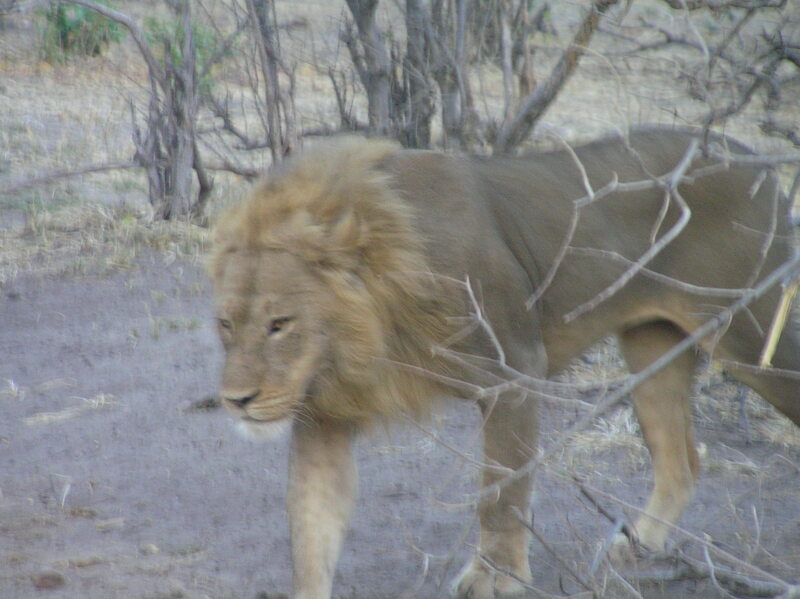 Now we are close, again it blurred a bit on me but he looked right at me, really no zoom here. 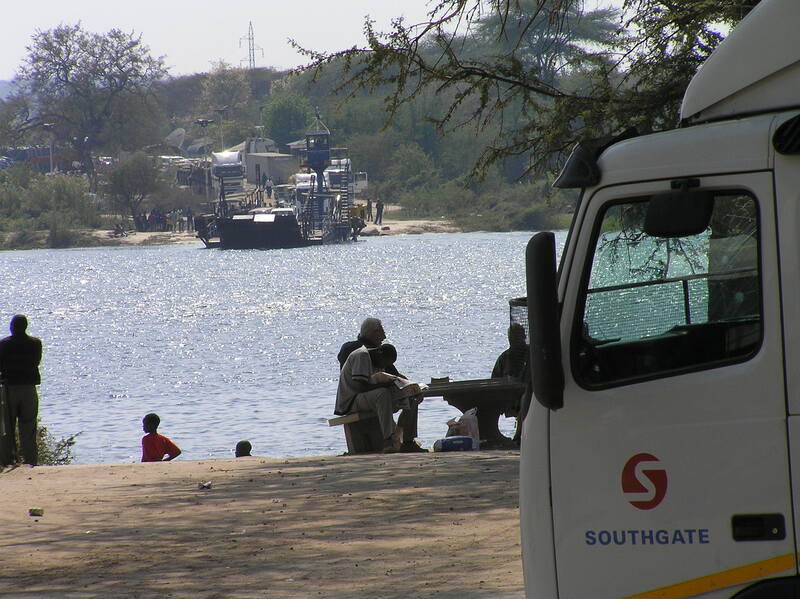 Ferry across the river from Botswana to Zambia. 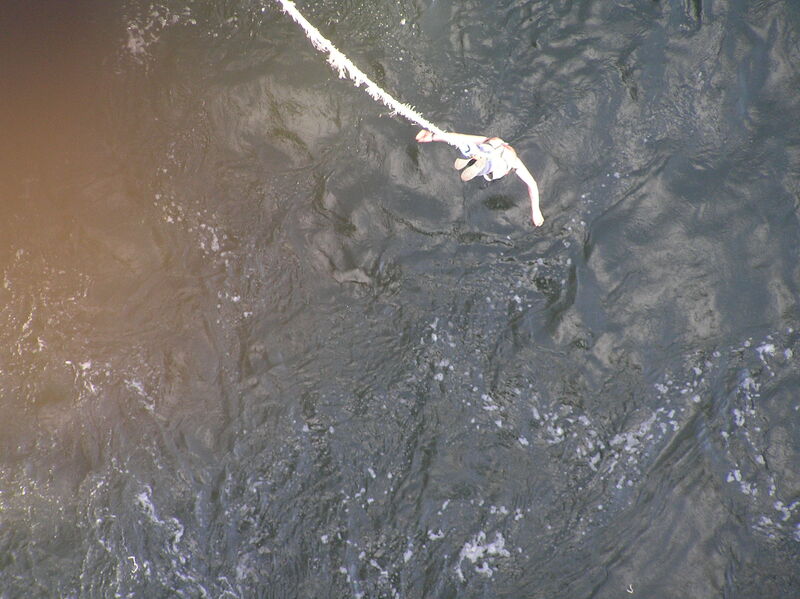 Daniel Jumping, head first not a sound! 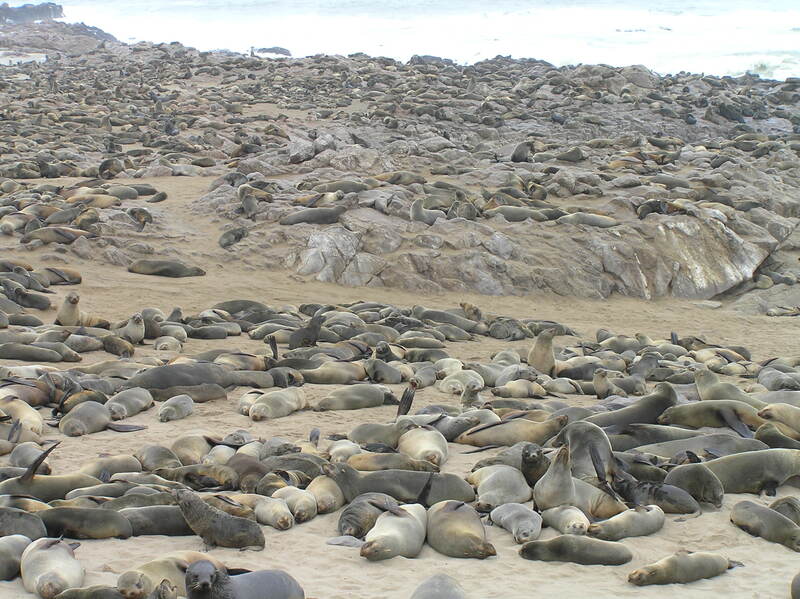 Lots of guts! Seen falls and got some great souvenirs. 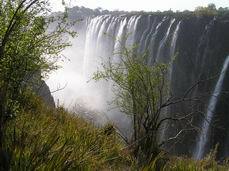 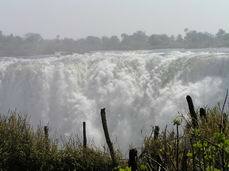 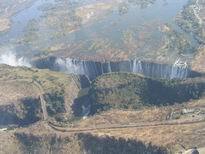 Picture by Wendy Hoogland of our group, Airplane view of Victoria Falls. 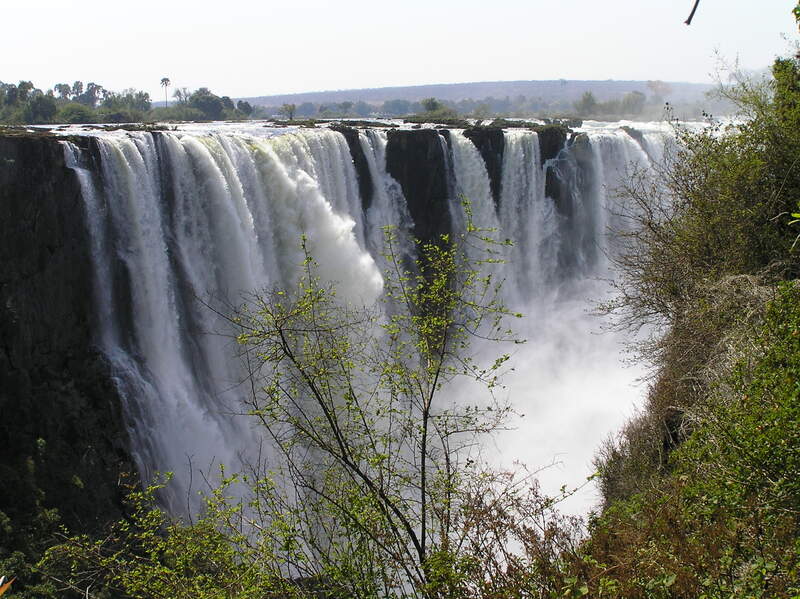 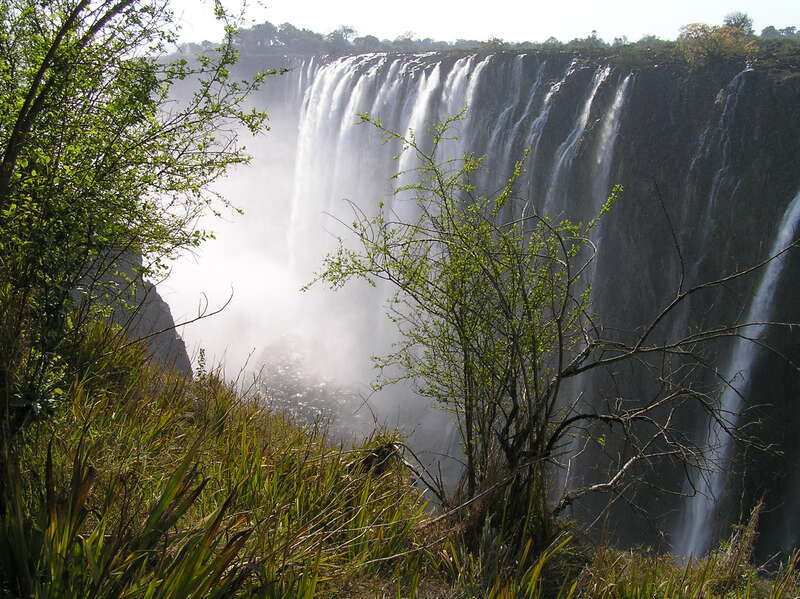 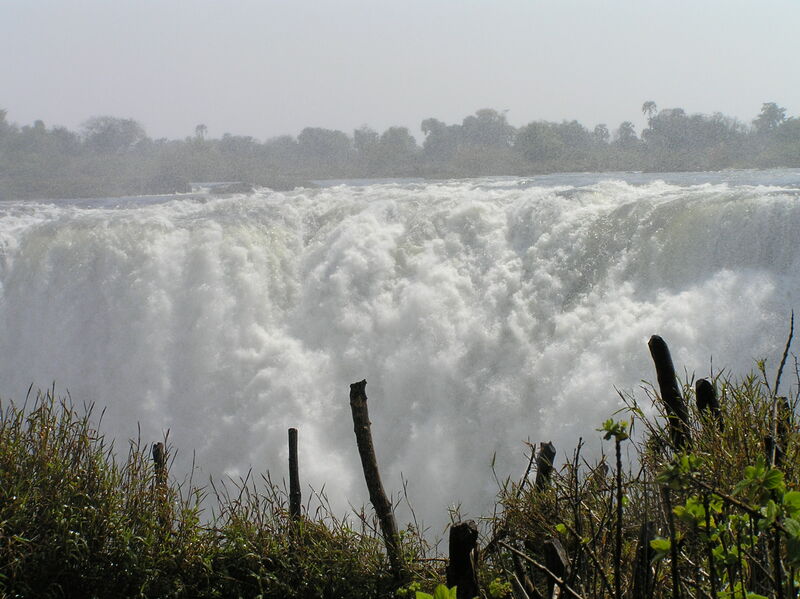 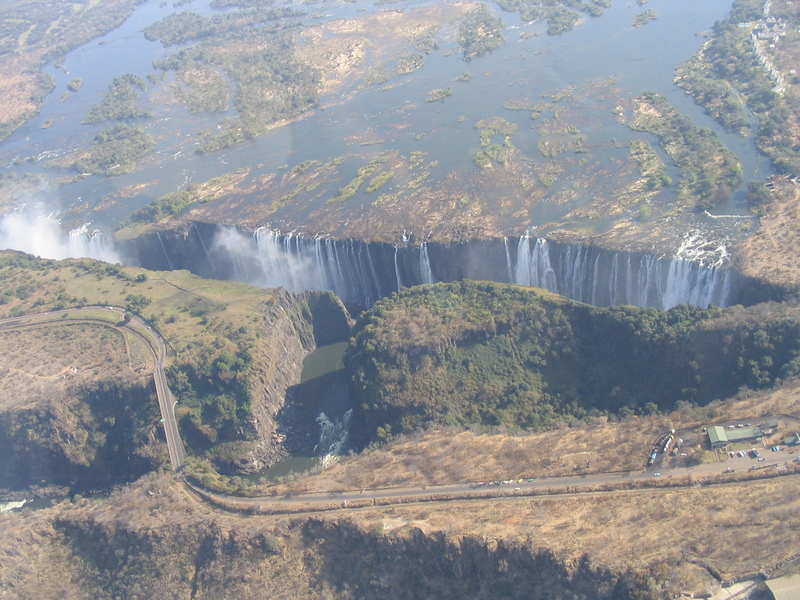 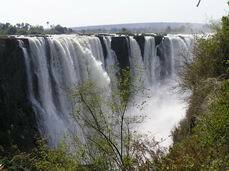 Note you can only see the Zambia side, The Zambabwe side is to the right as the falls basically makes a right angle turn. 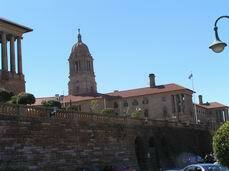 Capital buildings in Pretoria South Africa. 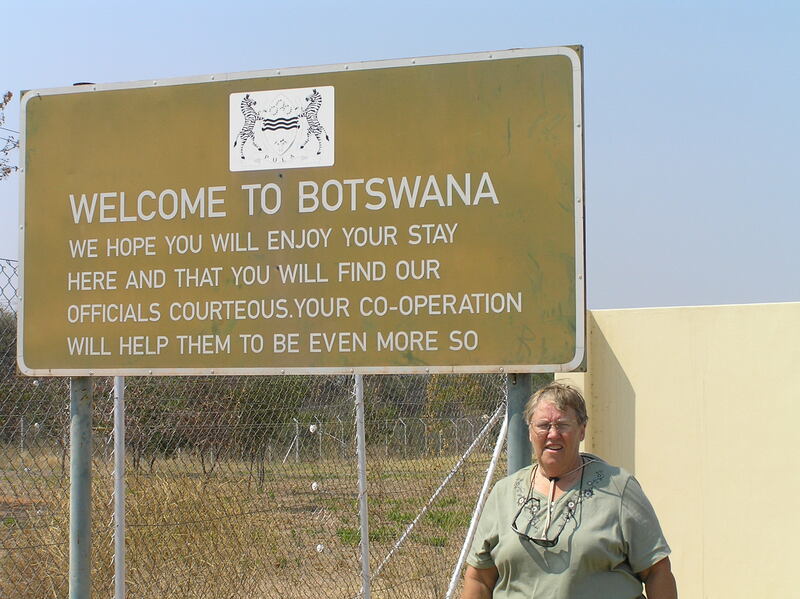 We spent two days and three nights here and ZR6ANF showed us around and the Word of Mouth Backpackers gave us information so we had a nice time visiting the city. 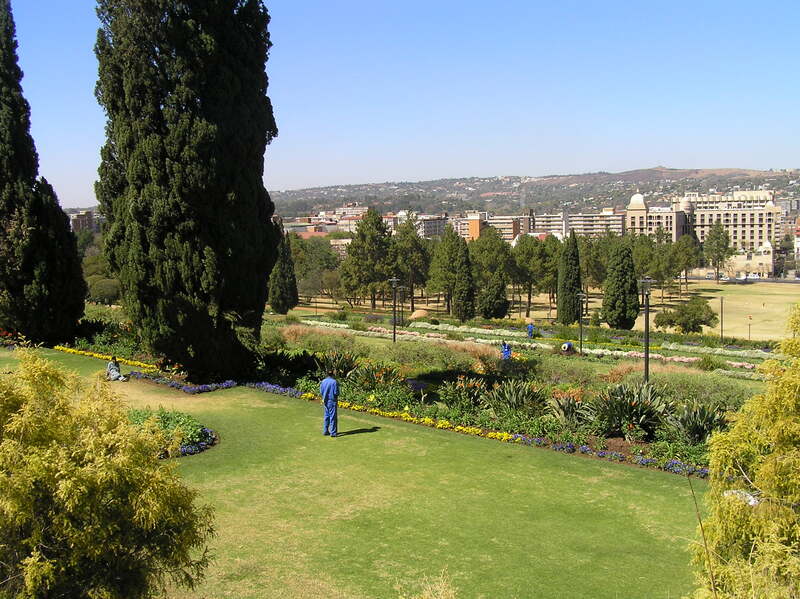 Gardens in front of the capital. 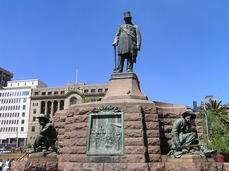 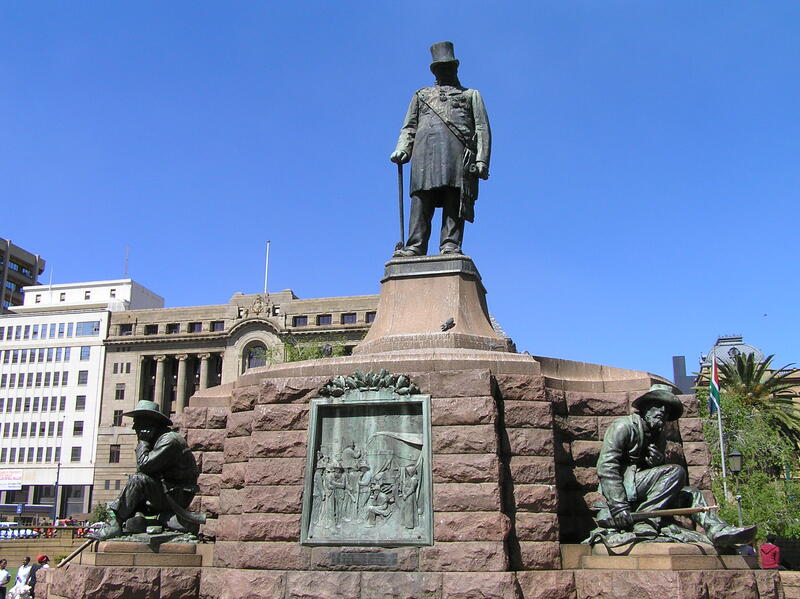 Statue of Paul Kruger in downtown Pretoria an early Dutch president.